<1908> - <1912>: 77 Central Ave. Merged with Presbyterian Hospital and relocated to So. 9th Street around the late 1960's. One of the most charitable institutions in Essex County, is the Eye and Ear Infirmary. 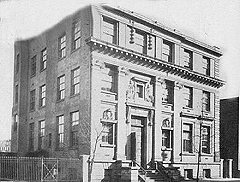 The hospital was founded in February, 1880 for the gratuitous treatment of the poor. Receives patients afflicted with diseases of the eye and ear. Capacity, about 40: two private rooms and 38 ward patients. The eye and ear patients 2 PM daily, except Sundays. Diseases of the nose and throat treated daily at 11 AM except Sundays.